It is our fortune that, we have born in Maharashtra where we inherited rich experience of culture, history and monuments. For the trekkers, Maharashtra is heaven with numerous forts, ranges and pinnacles to conquer. Most of the people are aware about some of the most significant forts in Maharashtra. But there are certain ranges where you need to trek/walk for a longer period of time and for longer distance. Such range treks are interesting thing which undoubtedly test one’s stamina and endurance. Most popular in between such range treks would be Panhalgad to Vishalgad, Rajgad to Torna, Katraj to Sinhgad, Torna to Raigad, Ratangad to Harishchandra gad and more. 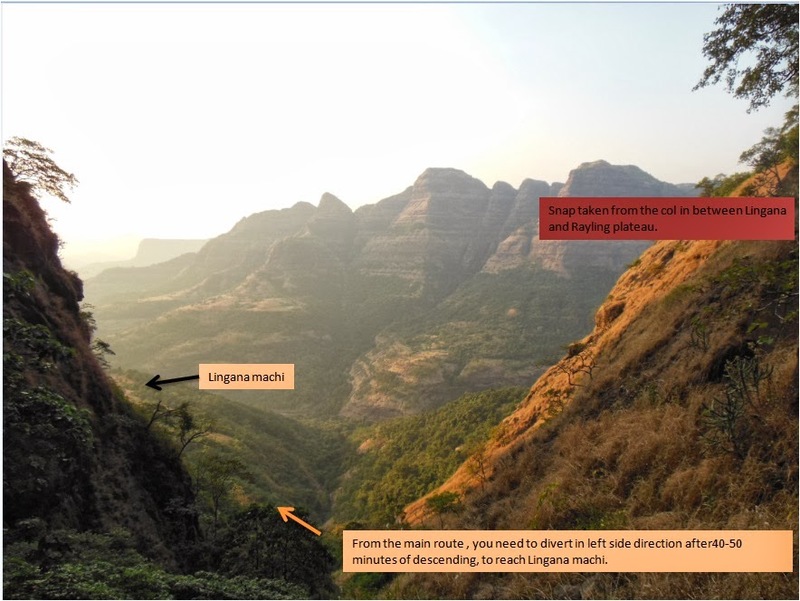 After exploring some of these treks, I have decided to trek down the grueling range route of Torna to Raigad. Mahadeo and Abhijit had already nodded positively for this trek. Gathering information from the blogs and Google maps, we have decided to start this trek on 22nd Nov 2013, evening. Collecting essential things like eatables, extra clothes, bedding, torch, we agreed to meet at Swargate Bus stand. Last bus to Velha (base village of Fort Torna) was @ 7.15PM. Mahadeo and I reached to Swargate on time but Abhijit couldn’t reach promptly and we missed the last bus. Start was very good J! We were in big dilemma about how to reach Torna. 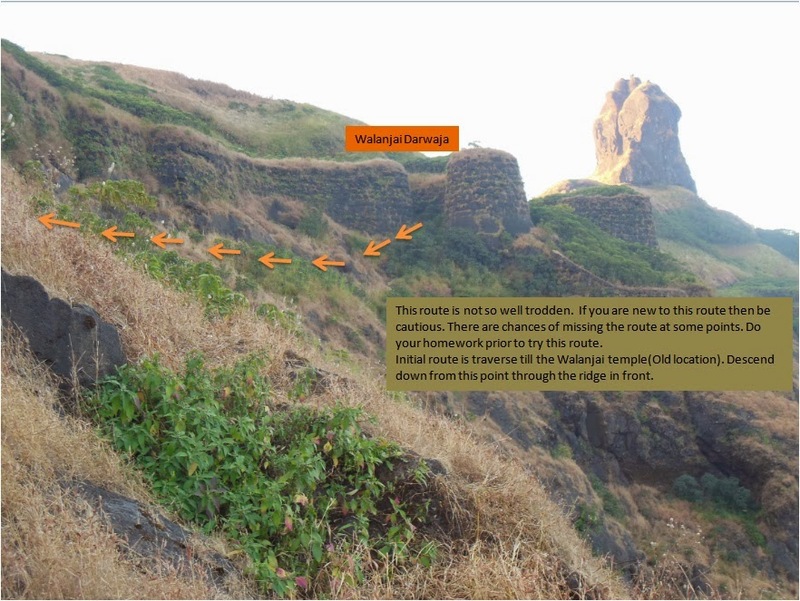 Transport facilities are very limited to Velha –Rajgad area, during night. We picked option of reaching Nasrapur phata and from there; try to catch rickshaw or jeep heading towards Velha. Upon reaching Nasrapur phata, we got ferry jeep till Ambavane. We tried to convince the driver to take us till Velha. But he asked for too much money so we stopped at Ambavane and had Dinner in a hotel. It was big question of how to reach Velha. It was still 20Km away from Ambavane. We started walking, thinking we would get a vehicle returning to Velha. By God’s grace, we got the tempo carrying construction equipment. After 30 minutes, we reached to Velha. What a relief to see it! As it was 2 days expedition, we couldn’t afford the delay in any itinerary, we planned. @ 11.15PM, we marched towards Torna. Atmosphere was awesome with chilling cold. Enjoying the environment and taking small breaks, we reached to Mengjai temple on Torna @ 1 am. To our surprise, the temple was overcrowded with trekkers. Their plan was to reach Rajgad, next day. Somehow, we adjusted in the temple and slept; to be ready for the grand route to Raigad. We get up early @5.30am. After morning rituals, we started heading towards Budhla machi. Our plan was to descend down Torna through Walanjai Darwaja; follow the Kanad Pass. Catch a vehicle till Pasli. From then follow the route going towards Mohri and Boratyachi Nal. Walanjai Darwaja is situated near to Budhla machi; camouflaged in the dense vegetation of Karvi. If you are new to this route, then you need to struggle a while to search this Darwaja. As Mahadeo already aware of this route, we couldn’t find difficulty to locate it. Getting out of Walanjai Darwaja, we followed the untraced route till the place of Walanjai temple. The idol of Goddess Walanjai is shifted to base village Bhatti, from its original location. From this point you need descend down the ridge in front. The route is scarcely defined. Limited trekker groups travelled by this route which is why it is not well trodden. At some points we found difficulty to trace the route because of thick verdure. To follow Kanad Pass, you need to take left direction after descending down some distance from the Walanjai Darwaja. But the Kanad pass route seems almost invisible. For the safe side and avoiding time loss to search the route, we started descending the same route to reach Bhatti village. At the last patch, we greeted by Nal like route having large stones everywhere. Following the same route, we reached to Temple of Deity Walanjai. Very specious temple with beautiful Idol of Goddess. From this temple, Bhatti village is 5 minutes away. It took us 2 hrs. to descend down. Always follow downward direction which is safer to descend. Do not traverse in this route (Except at the start). Filling our water bottles, having breakfast and tea by a caring ‘mavshi’, we started walking towards Pasli. There is very little frequency of public transport in this area. There is ghat section just after Bhatti village. It is very annoying to walk on tar road for a longer time period. We decided to take lift from the ongoing vehicles. To our luck, Abhijit received first chance to travel on bike till Pasli phata. We got honor to travel in a cab J. The owner of vehicle was land developer from Velha. He persistently talked about the changes in rate of land, builders from Pune/Mumbai showing interest in this remote area, future development plan in this region and so on. He was happy for the wealth earned through various land deals but he was not at all concerned about the loss of ecosystem and the natural beauty. Very sad to see this scenario!! After some years, we may not enjoy the tranquil surrounding of this expanse. At Pasli phata, we inquired about the shortest route (in terms of time) to reach Mohari. From this point, you can opt for route going towards Kelad Khind and one headed for Varoti. Earlier week, Mahadeo had tried the route from Kelad Khind. This route is longer and very tiring as whole track is on top of mountains; open to sky with fewer trees. During afternoon, it would drain you to great extent. So we decided to opt for Varoti. Till Varoti village, kachha road accompanied us. We asked villagers to show shortcut route to reach Mohari, if any. One Grandpa escorted us till the point; from where we could reach the destination without losing the path. One needs to cross Welwandi river thrice during this route. After third river crossing, one needs to climb the hill standing in front. Route is well trodden from this point. Once we climbed hill till end, we reached the path; which is coming from Kelad khind. We have seen first glimpse of Lingana and Fort Raigad. Scorching heat made it difficult to walk faster. The whole route was boring and irritating. There should be another shortcut route this patch. We were not in mood to search it. So we directed the same dull route. Finally we reached the Mohari village. We have finished lunch and rested for a while. Mahadeo was aware about the Boratyachi Nal route. So we were confident about crossing the whole nail before evening. We have started walking towards Nal @ 2.30PM. Route till Nal is very well trodden. The same route is also going towards Lingana. After 20 minutes, we were at the start of the Boratyachi Nal. If you are new to this route then it would take some time to locate. Because the starting point of Nal is covered with dense shrubs. What a first impression!!! What a deep gorge descending steeply to the Konkan!!! We gradually started descending this route. Abhijit was slow mover due to leg aching. I was pretty confident of crossing the while route till evening. After 40 minutes of descending, Mahadeo told us to traverse in right direction. This is the path which goes towards the col in between Lingana pinnacle and Rayling plateau. For newcomers, it would be hard to spot this route. Identification mark would be a hook is fixed in the rock face at this junction. 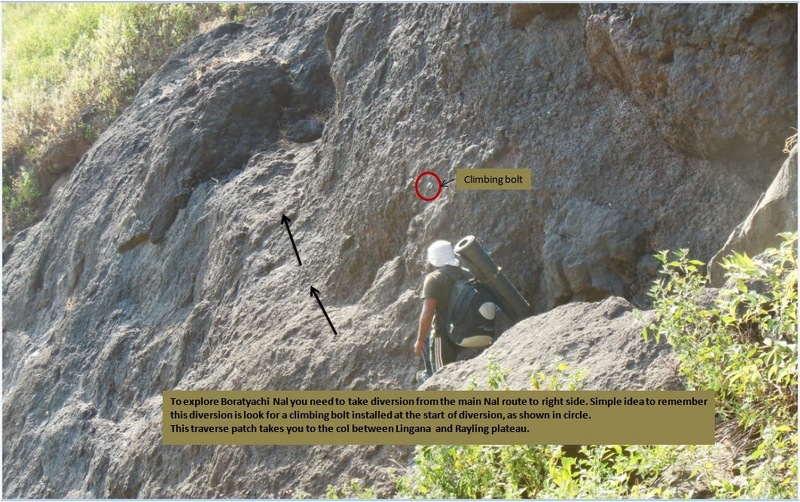 Also you need to descend, big boulder (not difficult) before reaching this diversion. Traverse patch is not enough supported but not of great risk too. You can easily cross it if cautiously judged your footsteps. No need of ropes. This traverse route eventually reached to the col in between Lingana and Rayling plateau. Mahadeo was familiar with this route this till this point. For climbing the Lingana pinnacle, you need to reach the same place before actual climbing. Abhijit was very tired and Mahadeo was without Chappal (Yup. Mahadeo wore Chappal in this and every trek. I still couldn’t understand why?? J). His chappal was torn during the trek. The collective effect taking toll on our schedule. From the col, you need to take right direction and descend down. Another Stoney route!! As time passed, we realized that we might not able to cross the route. Speed was getting slower and slower. After descending considerable distance, we searched for a diversion to left side. It was darker and torches came out of bags. We were desperately searched for the any route going in the left direction; diverted from the main stoney route. At one point, the main route seems difficult (not impossible) to descend, at that point we found a route going towards left direction. After walking in dark with the only light of torch, we reached a plateau. This is Lingana machi. From this plateau you need to go in the left direction till the end and descend down to Pane village. But due to night we couldn’t able to locate the path. After searching an hour, we finally decided to stay on this open plateau. Unfortunately, we have very little water with us. Big blow!!! Every one of us was thirsty. The first thing we did; searched a place to stay; collected loads of woods from the nearby jungle; lighted the campfire and settled to spent the whole night. We thought of having a dinner but the water availability prevented the thought. After sometime, we saw torch light flashing from the Lingana cave. We thought there would be some trekkers get stuck en route. We called them for their situation but hadn’t got response. After trying some time to grab their attention, finally we slept alertly. During midnight, the same people came to us. To our surprise, there was one man and one woman. Earlier we thought, they might be Sandalwood thieves. But they were villagers from Lingana machi. We asked them about the route to descend down the machi and reaching to Pane. They directed us the route and left us. We decided to get some sleep again till the morning. During night we have heard sound of wolves in the jungle. That was bit frightening. Somehow with the first ray of sun, we have started along the route showed by those villagers. From the point we entered the machi from the base of Lingana, we need to go exactly at the end of the machi in opposite direction i.e. towards the direction of Raigad. The route is quite traceable except some patches. From the Lingana machi, it took only 20 minutes to reach base. We have seen Kal River. We took bath in the river and had some breakfast. Relaxing there in very serene environment, we headed towards Pane village. Typical Konkani houses, temples and people. Our next target was to reach Varangi village. People told us to go to Pane phata and catch ST bus going to Varangi @ 9.30am. We followed their advice and reach Pane phata and caught the bus to reach Varangi. Actually there is another shortcut route to reach Varangi form Pane village. By walking, we can reach early to Varangi than walk till pane phata and wait for bus. Dam construction work is going on the Kal River. We headed towards Chatri Nijampur. We thought, we would get vehicle going towards Raigad from Nijampur. It was hardly 30 minutes route to reach Nijampur from Varangi. In Nijampur, we got very warm welcome by Sarpanch of Nijampur. He offered us tea, biscuits. What a humble and kind man!! We felt ourselves fortunate to meet such people during trekking. There we met a group from Osmanabad ‘Shiv Rajyabhishek Samiti’. Vishnu Ingle from the group was very enthusiast person. He accompanied us till the fort. There group descended through Agechi Nal( like name the nal was fiery as told by him). From Nijampur, we confirmed out direction towards Takmakwadi. Do not follow the ghat road. It is very lengthy and tiring. Follow the route through small jungle patch which will lead you to the Takmakwadi. From there, distinct route started and we headed towards Raigadwadi. 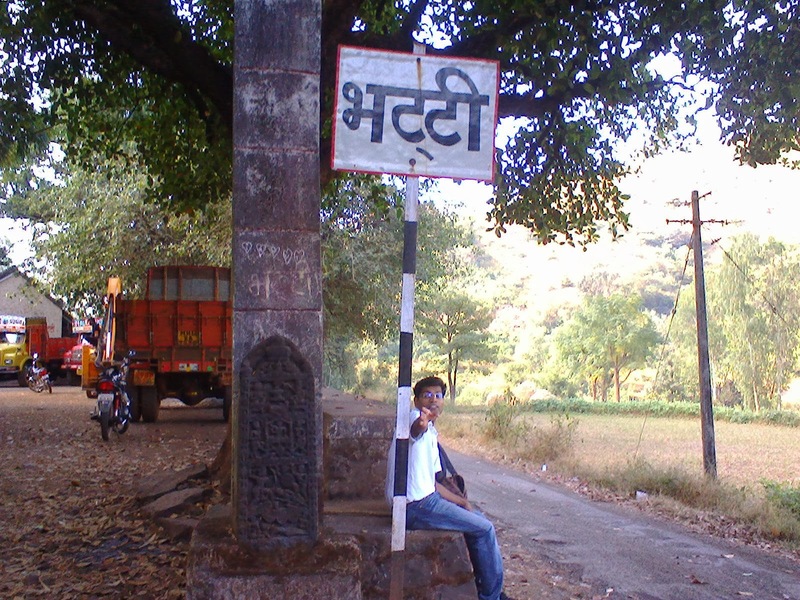 This is the last village before Raigad. From then tar road starts and within 30 minutes we reached to the point where steps of Raigad start. The mighty capital of Maratha Empire!!! Truly deserving!!! We were so happy to reach our destination. After relaxing and some breakfast, we started our final round of step climbing. Mahadeo and Abhijit decided to stay on the fort for a night. I couldn’t able to do that due to some unavoidable reasons. So I hurriedly went to the top of fort. Offered the Manacha Mujra to Chhatrapati Shivaji Maharaj. Some sight-seeing and clicking the snaps, I descended down to catch bus to Pune from Mahad. 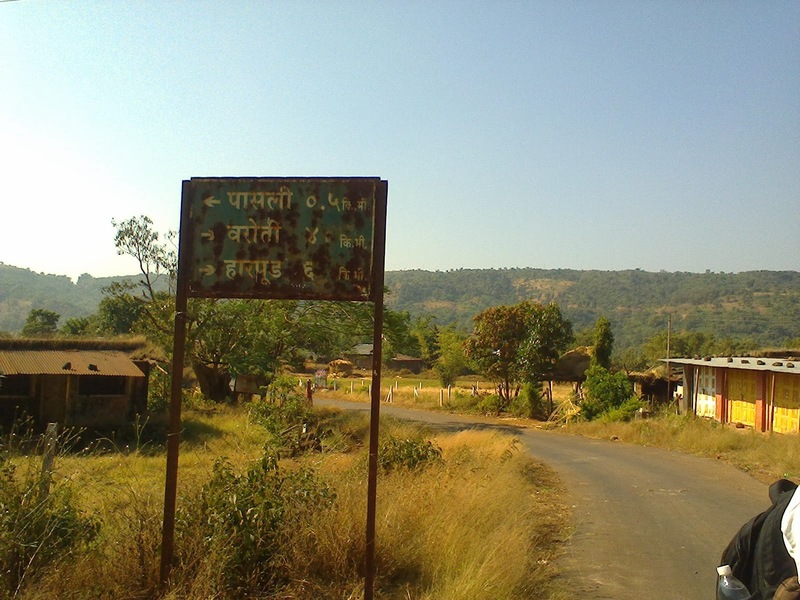 From Raigad base you can get private vehicles plying towards Mahad. With utmost contentment, I reached to Pune in the midnight. And the royal journey to Raigad ends here!! !